About a year ago I discovered a very large tree bearing orangey red blossoms. Everything about this tree, including the flowers, said “magnolia.” For a year I have been trying to get a precise identity of it. And now (Feb. 2015) I have. 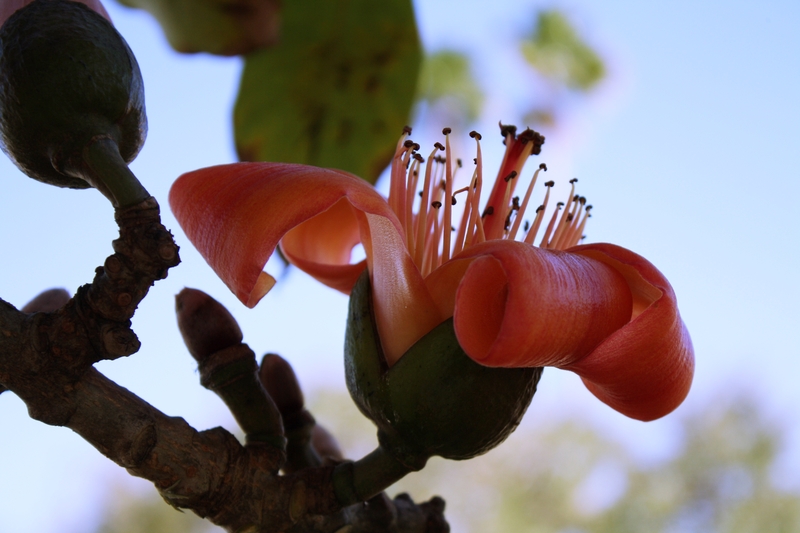 It is a Bombax ceiba, of the mallow family. It is from Asia. It is gorgeous, but it is not a magnolia. I am not going to change much about this post, not even the date. Just keep in mind the copy was written a year ago, before I learned this tree is not a magnolia. Also note, the information toward the end of the article concerning the Fraser magnolia is correct. Yesterday (in 2014) I happened to be driving up Main Street in Avon Park, a nearby town not much larger than Frostproof (where I am right now 2014) and I spied bright red blossoms in the distance. We were in the historic section, off the main highway. There are wide park like medians between the two lanes of traffic, and the trees that were planted there so many years ago have grown quite large. 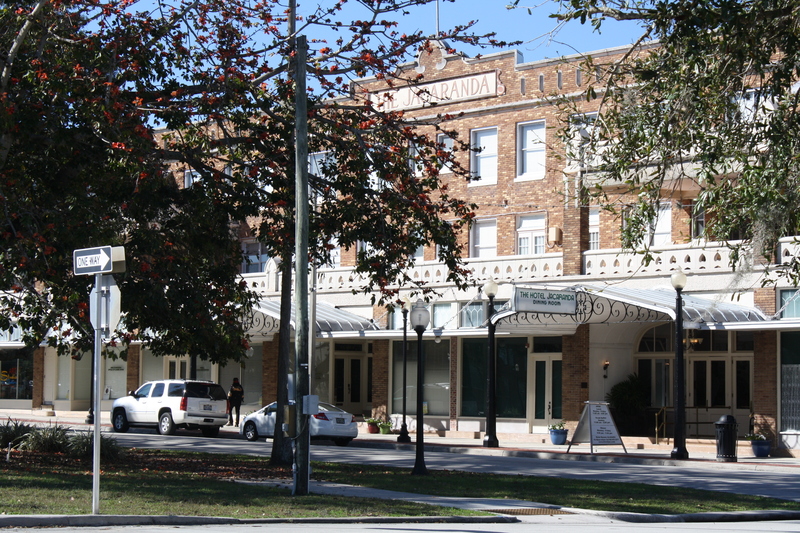 As I drew nearer I could determine the red blossoms belonged to a very large deciduous magnolia, I suppose 50 feet high or better, whose drooping lower limbs spread gracefully over the median in front of the old Jacaranda Hotel. I knew there were red magnolia species, but I had never seen one. What a treat! I went back today with my camera. These flowers are a gorgeous orangey-red color, much like the fiery red variety of flame azalea. This magnolia blossom has not the common cup shape, nor even the drooping feathery shape. It favors a lily in this respect with a blossom resembling a star when the petals are fully unfurled. I have been unable to identify the variety of this tree, but I am certain it is a magnolia due partly to its growth habit. In this old tree, it is pretty unmistakable. Also the flower buds (you can see one in the top left of the photo) are clearly magnolia buds. This is such a wonderful find I wanted anyone who might be interested to see it. There are many magnolia species. In the South we are perhaps most familiar with the evergreen magnolias with their large cup shaped flowers and heady scent. But we have our share of deciduous magnolias that typically bloom before the tree puts on its leaves. There are some beautiful pink and purple ones blooming here now. On the way into Brevard from Lake Toxaway there used to be one on the right hand side of the highway. Most years the cold would get it and you’d never get to see its blossoms, but once in a while it would get by, and Oh! what beautiful orchid colored flowers they were! I’m not sure it is still there. Look for it on Highway 64 near Forest Hills Road. No discussion of magnolias should exclude Transylvania County’s Frazer magnolia, or cucumber tree. Incidentally, this magnolia was first discovered by Bartram; however, credit for it eventually went to Frazer. These are fairly common in our area of the mountains. Note the super large leaves. 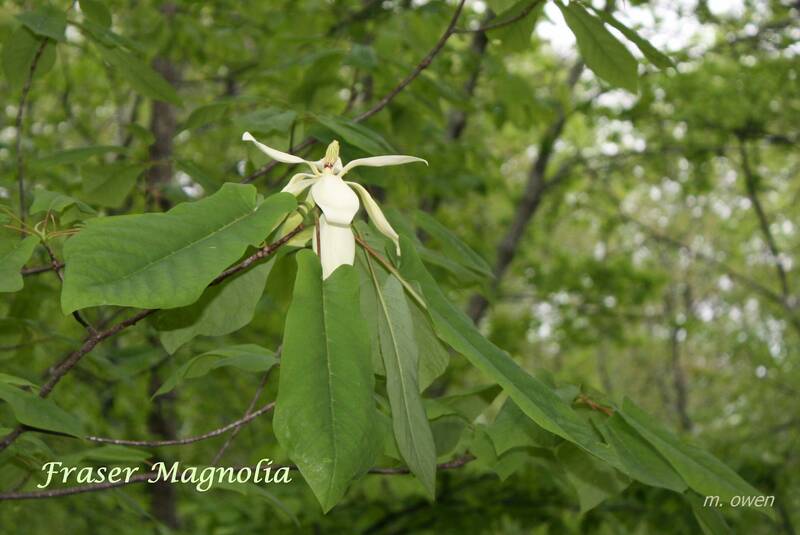 This is a deciduous magnolia; however, this one blooms after the tree puts on its leaves. Here is the hotel. The magnolia tree is on the left. You can see the red blossoms if you look carefully.